first came across the name R.D. Wingfield in 1989 in the Groucho Club in Soho at a social evening of the Crime Writers’ Association. I was a new member of the CWA, but one of few writers I had already met, Robert Barnard, was present and he approached me clutching a well-thumbed paperback which he thrust into my hand. He had, he said, just returned from Canada where he had bought the book (Robert being one of that rare breed of crime writers who actual reads crime fiction). It was, he felt, “rude, crude and a bit rough” which had made him think automatically of me. “It’ll be right up your street,” he said. The book was Frost At Christmas, which, I subsequently discovered, had been published as a paperback original in Canada in 1984 but was yet to be published in the UK. When it did appear, from Constable, later in 1989, much to my annoyance it slipped by me completely. In fact, it seemed to slip by most reviewers, unnoticed by most except for the Oxford Times and the eagle-eyed Philip Oakes of the Literary Review. This was incredibly frustrating. I had loved the book and immediately wanted others to read it. In fact I loaned the Canadian paperback to George Thaw, then covering books for the Daily Mirror, and never saw it again. When I told Rodney Wingfield this story, ten years later, he presented me with a signed first edition Constable hardback which he claimed he had “found down the back of a sofa”. I had, of course, no idea at that time of the story behind the creation of Inspector Frost, I just assumed that this slovenly, rude, put-upon, bumbling detective – who was at heart intensely human, shrewd and brave – had sprung, fully-formed from the author’s typewriter, perhaps as a reaction to the more cerebral sleuths such as Morse and Dalgliesh. I had certainly never come across a fictional detective like him before. Here was a policeman who had to juggle several cases at once (not just a murder and the traditional sub-plot), who was not above fiddling his mileage claims and the overtime statistics, who didn’t quote poetry or claim any esoteric specialist knowledge and who used the blackest of humour when confronted with the gruesome realities of his job. Jack Frost seemed remarkably like many of the real CID detectives in West London I knew at the time, or at least a middle-age version of them. Here was a policeman you might not like, but it was a character anyone (other than those readers wearing Golden Age tinted spectacles) could recognise as an ordinary bloke doing a particularly unpleasant job. When the second novel, A Touch of Frost, was published in 1990 by Constable, I got a chance to review it for The Sunday Telegraph and dutifully raved that it was “altogether a funny, frantic, utterly refreshing brew”, having particularly enjoyed the scenes of power politics and infighting among the police themselves, which again, was something few other writers were tackling. I was not alone in my praise. Far more senior critics than I – Marcel Berlins, William Weaver and Patricia Craig – all scored it highly. I am told that my signed first edition is now worth £2,000, but at the time I was totally unaware (as I think was the author) that a rather large genie was to escape from an initially modest little bottle. Rodney Wingfield was born in 1928 in London’s East End and by the Sixties was working as a clerk for the Fina oil company, but devoting all his spare time to writing short, one or two-act plays. In 1968, BBC Radio Drama bought his 45-minute play Compensating Error and swiftly commissioned two more. All three broadcast plays (at a time when radio drama attracted audiences of millions) were well-received enough to persuade Rodney to give up the day job – not that he needed much persuading – and for almost twenty years he supplied the BBC with a steady stream of dramas noted for clever plot twists and surprise endings. He also tried his hand at pure comedy, once writing a series for Kenneth Williams (“And once was enough!” as he told me). George (later Lord) Hardinge offered him a £50 “non-returnable” advance for a crime novel. Rodney, who was to say later that he had been spurred on by the words “non returnable”, duly spent “a swelteringly hot summer bashing out” Frost At Christmas which was then promptly rejected by Macmillan! Loathe to abandon the laconic, chain-smoking copper Jack Frost he had created, he recycled the character into his radio work in the play Three Days of Frost in 1977, with Ronnie Barker pencilled in for the lead. Television commitments meant that Barker was unavailable and the role of Frost was taken by Leslie Sands, whose performance (as Frost) was to remain Rodney’s favourite. Spurred on by the radio play’s success, Rodney, who always described himself as “a reluctant author” and often found himself “thoroughly disenchanted with the grind of writing full-length novels”, was encouraged to persevere with his original, rejected, novel and eventually, after a gap of twelve years, Frost At Christmas made it into print in Canada and, five years later, in the UK. I knew none of this when, at some point in 1991, I met Constable editor Miles Huddleston at a party in London and we got to chatting about Jack Frost. Miles told me that a new novel (Night Frost) was likely to appear in March 1992 but could tell me surprisingly little about the author, except that he communicated with his publishers mostly by Fax. Miles remembered the conversation for just before Night Frost appeared the following year, we ran into each other again and he said: “I’ve got two words for you: David Jason”. When my review copy of the new book arrived, it had the legend “Soon to be a major Yorkshire Television series starring David Jason” stamped on the dust jacket. Like the gestation of the Frost novels, the birth of the (still running) television series was unusual and the story has been recounted by Richard Bates, the executive producer of A Touch of Frost and, incidentally, the son of H.E. Bates, the author of Darling Buds of May which starred David Jason when adapted for TV. In 1992, there were two undisputed super stars of British television. One was John Thaw, most famously for Inspector Morse, and the other was David Jason who, after a string of comedy dramas could virtually do anything he wanted. Whilst searching for a new vehicle for his talents, Jason, or so the story goes, toyed with the idea of a detective character, not surprisingly as “cop shows” were all the rage. According to Richard Bates, David Jason went on a scuba-diving holiday with three detective novels in his luggage. In some versions of the story, one of the three was one of my titles, Angel Hunt, but I’ve never really believed that. One of them certainly was A Touch of Frost and it was the one David Jason liked. After radio and novels, Inspector Frost was to become a household name thanks to television. Although a great popular success, there was one viewer (among the millions) who remained unimpressed – Rodney Wingfield. He once told me: “I have nothing against David Jason as Frost at all, he just isn’t my Frost” and, legend has it, he was ferociously critical of the pilot episode script. After that pilot episode aired in December 1992, Rodney claimed never to have watched another episode and he declined to appear on ITV’s 2006 Super Sleuths, a retrospective appreciation of television detectives. He would say that he would only know that a new series was in the offing by watching TV award shows to see if David Jason had a moustache or not. Quite why Rodney hated the television incarnation of Jack Frost I honestly don’t know. Certainly, the television version cut much of the rude humour, presumably to give comedy actor Jason more gravitas, but there are elements of Frost – the small man put upon by authority figures, the ducker-and-diver, the cunning but always big-hearted – which no actor I can think of could do better than Jason. Whatever his misgivings, Rodney was now committed to Frost and the security it brought. His last radio play for the BBC was Hate Mail, which had been broadcast in 1988, and thereafter he devoted himself, reluctantly, to novels (only six in totals) and the rare short story. Which was how I came to meet him. But first came the faxes. In 1997, Maxim Jakubowski and I were in the process of editing the second anthology of short stories in the Fresh Blood series, and were looking for new British authors, mostly young, who were writing crime fiction “with attitude”. I proposed R.D. Wingfield on the grounds that he had, at the time, published only three novels. The fact that he was, at the time, 68 and had almost thirty years experience of script-writing behind him simply didn’t occur to us. Despite this, Rodney and I kept in touch, by fax and phone, and when a Japanese publisher approached him a year later (suspiciously on April 1st), offering him $200 for a translation version of Just the Fax, he faxed me asking what he should do. I told him to ask for $300, which he did and he got, and then insisted on giving me half. His Frost books were already popular in Japan and in many other countries, including Italy, although when his Italian publisher could not find a recent photograph of their famously camera-shy author, they used one of Kenneth Williams instead. 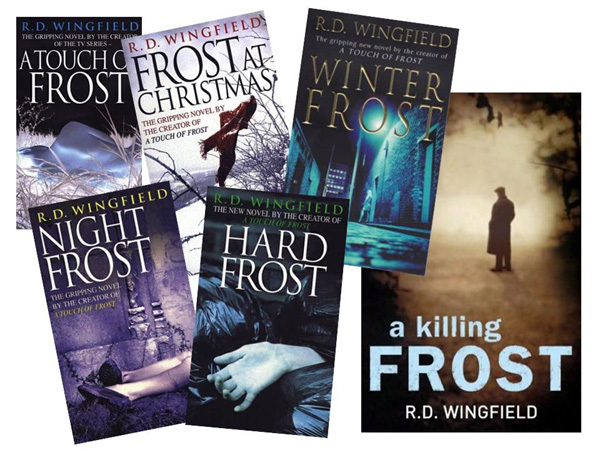 Despite threatening that Hard Frost had only been written under pressure from his American publisher (and American fans who were increasingly searching the new-fangled internet for news of Jack Frost) and that it would “be the last novel” and allow Rodney to back to his beloved medium of radio plays, he was persuaded to embark on a fifth, Winter Frost, which was published in 1999. Perhaps Rodney realised that the opportunities for radio drama had contracted or perhaps he simply didn’t fancy the “schmoozing” which needed to be done by any writer trying to work in radio or television. He was never one for show-business (or publishing) parties and had a healthy distrust of anyone working in television. [After one dispute with the BBC in 1984 he submitted the highly-regarded six-part radio serial The Killing Season under the name ‘Arthur Jefferson’ - the real name of Stan Laurel]. Living quietly in unfashionable Basildon in Essex, he lived a very private life, caring for his invalid wife and her death was a great blow, from which I thought he might never recover. He rang me one Saturday morning in a fury, having just discovered that there was an “Inspector Frost” short story in the TV Times. He was furious because he hadn’t written it! It had in fact been written by one of the TV series’ scriptwriters and because it had appeared under his name, it could not, so the lawyers said, be accused of being “passed off” as the work of Rodney Wingfield. Despite a letter-writing campaign to everyone we and Rodney’s agent could think of, the lawyers turned out to have a watertight case under English law (though not, I believe, American). Some months later, a brief, three-line announcement in the TV Times was made to the effect that the story had been based on the characters in the television show and was not the work of R.D. Wingfield. And that was all Rodney got from the affair (at a time when a national newspaper would have paid £5,000 for a short story from him). No wonder he distrusted television. By now Rodney had retired his fax machine and had become an enthusiastic e-mailer, regularly sending out a “joke of the week” or cartoons or bizarre internet links which had tickled his fancy. The last time I saw him, he invited me down to Basildon for lunch on condition I drove (he didn’t) us both to the restaurant. By now he was 75 and he looked frail, although still energetic and full of fun. He surprised me by telling me about another novel in the pipeline, which he originally called An Autumn Frost but which eventually became A Killing Frost, now published posthumously by Bantam. It is classic Frost and vintage Rodney, with multiple cases being piled upon our hero (I lost count of how many) and a spectacularly boorish new boss for Frost in the shape of the odious DCI Skinner, who makes Superintendent Mullett seem positively benign – but fans need not worry; Mullett is in there too, and Frost bests them both. There is, however, a recurring theme of Frost being dog-tired as the cases start to pile up and there are some repetitive elements which a more ruthless editor might have eliminated. Nonetheless, A Killing Frost moves at a ferocious pace and the multiple strands of the plot are tied together by our dogged and quite ruthless hero. It is a fitting tribute to Rodney’s creation and only sad that it has to be published posthumously. I had absolutely no idea that Rodney had been battling cancer, perhaps for seven years, but when the end came, it came relatively quickly, in July 2007. And of course, he had the last laugh. At his funeral, the officiating priest had just informed the congregation that Rodney had insisted on being buried with his mobile phone, “just in case of oversights”. Right on cue, with immaculate timing, a mobile phone began to ring and everyone in the church held their breath. It turned out to be the priest’s own mobile which he’d forgotten to turn off. As we left the church to the strains of Frank Sinatra singing My Way (another specific request from the departed), I was pretty sure I could hear Rodney chuckling somewhere. Taut little thriller with a surprise in store. With Robert Lang, Dudley Foster, Malcolm Tierney, Patrick Newall, Beth Harris, Patrick Tull, John Nightingale, Geoffrey Segal, Matthew Walters, Ian Thompson, Claire Ballantyne. Produced by Robert Cushman. A young child has gone missing. There is a complex interplay between police, parents and kidnapper ... and a most surprising resolution. With Frederick Treves as Inspector Nuttall, .... Sampson* as D.S. Dalton, John Pullen as Mr. Hallett, Alifya Charlton as his distraught wife; also stars Douglas Blackwell, Martin friend, John Rye and J.J.Murphy. *blip on tape; first name, anyone? And who directed / produced? .............extract from VRPCC newsletter, Oct 03..... Rodney Wingfield writes..."Cleft Stick" was a play that nearly did not get bought. I had submitted it and was confident that it would be accepted. I was in Broadcasting House on an entirely different matter when the Script Editor for this slot called me in and said that he was afraid they would have to reject "Cleft Stick" because the Script Reader had given it a poor rating. He showed me that Script Reader's report which said that he had guessed the ending right from page 1. This was ridiculous, and it was obvious he had fallen for one of my "red herrings" and had not read beyond the first few pages. I asked the Script Editor, as a favour to me, to read the play himself. He did, and the next day 'phoned to say he thought it terrific and that they would be buying it. If I hadn't been at the Beeb that day, it would have been rejected". Producer: Glyn Dearman: R4 02-May-1973. Cast List : Alan Dudley, Peter Tuddenham, William Fox, John Baddeley, David Gooderson, Katherine Parr, Chrys Sal, William Eedle, Nigel Graham, John Hollis. Producer: John Cardy: R4 02-Jun-1977. Cast List : Monica Grey, Norman Shelley, Jonathan Scott, Peter Woodthorpe, Howard Goorney, Lewis Stringer. Other parts: Daisy Bell, Brian Gear Elizabeth Havelock, Douglas Leach, David Ponting. creepy 15m play produced by Gerry Jones. R4 7-Apr-1979. Cast List: John Pullen, Rosalind Ayres, Leonard Fenton, Fred Bryant, Gordon Dulieu, Elizabeth Lindsay. We are in Inspector Frost territory in more ways than one...the setting is Pulford, just outside Denton, and Leslie Sands plays Sergeant Fowler, sorting out the mess during and after a series of gruesome deaths. His sidekick Constable Beaumont is played nicely by Nick Orchard, and Nicholas Courtney is excellent as the supercilious Superintendant Chadwick, Fowler's temporary boss. The other cast members are Paul Nicholson, Conrad Phillips, John Gabriel, Malcolm Young and Rosemary Segal. The programme was directed in Bristol by Brian Miller. This play was my initiation into the world of Rodney Wingfield, the (now) under-used and probably no-longer-used and expert radio dramatist. A fine performance from Derek Martin delivers Frost with pace and beautiful timing. The whole has plenty of twists and a satisfactory dénouement. Why no more "Frosts" were commissioned by the BBC after this one defeats me. Glad to say that I still revel in the YTV/David Jason productions, thankfully repeated ad infinitum. Leslie Sands did "Three Days of Frost" nicely, but, for me, Derek Martin has the edge. (Donald Campbell, VRPCC newsletter) ........note from N.D: both "Frosts" were produced by Graham Gauld, who also produced the Hobbs & Shelley "Sherlock Holmes" dramatisations . Harry, an explosives expert, is in the demolition business, blowing up old factory chimneys. But years earlier he used to work for the Section, an undercover part of the Ministry of Defence, and was involved in an assassination attempt on a rising black politician. An attempt is made on Harry's life, after one of his old army colleagues turns up on his doorstep - is this coincidence, or is Kabinda bent on revenge? Or is the Section up to its dirty tricks? This is a superbly-paced thriller, broadcast first for the BBC but also put out in Canada and Australia. It stars Bob Peck as Harry Davis, Judy Berry as Jenny Brown, with Stephen Thorne, Jim Reynolds, Alan Dudley, Aubrey Woods and Peter Howe. Produced by Ian Cotterell.